Caspak language, "from the beginning"
For several minutes no one spoke; I think they must each have been as overcome by awe as was I. All about us was a flora and fauna as strange and wonderful to us as might have been those upon a distant planet had we suddenly been miraculously transported through ether to an unknown world. Even the grass upon the nearer bank was unearthly--lush and high it grew, and each blade bore upon its tip a brilliant flower-- violet or yellow or carmine or blue--making as gorgeous a sward as human imagination might conceive. But the life! It teemed. The tall, fernlike trees were alive with monkeys, snakes, and lizards. Huge insects hummed and buzzed hither and thither. Mighty forms could be seen moving upon the ground in the thick forest, while the bosom of the river wriggled with living things, and above flapped the wings of gigantic creatures such as we are taught have been extinct throughout countless ages. 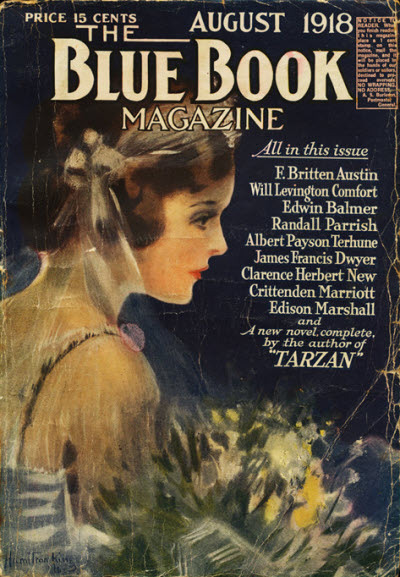 The worlds of Edgar Rice Burroughs have been analysed and interpreted countless ways: from literary analysis of themes and inspirations, to more speculative "in-universe" scholarship attempting to explain the mysteries within the stories. Caspak presents a very unusual variation on the dinosaur fiction genre exemplified by Arthur Conan Doyle's "The Lost World" and others. With the Lidenbrock Sea and Maple White Land, the explanation for how these creatures could exist was essentially due to their isolation - deep in the earth, an elevated plateau - where the conditions which led to the evolution of the rest of Earth did not take effect. The presence of animals from different periods of history could be explained as isolated populations which somehow found their way into these lost worlds, much like the protagonists of the stories. From the great inland lake behind us came the hissing and the screaming of countless saurians. Above us we heard the flap of giant wings, while from the shore rose the multitudinous voices of a tropical jungle - of a warm, damp atmosphere such as must have enveloped the entire earth during the Paleozoic and Mesozoic eras. But here were intermingled the voices of later eras - the scream of the panther, the roar of the lion, the baying of wolves and a thunderous growling which we could attribute to nothing earthly but which one day we were to connect with the most fearsome of ancient creatures. The natural history of Caspak and its anomalous fauna is thus a great deal of fun for speculative evolutionary enthusiasts, as is the language, sociology, anthropology, and demography of the many hominid species. The ERBzine alone is fully of excellent studies and articles on the story (including Woodrow Edgar Nichols Jr's magnificent 26-part odyssey ERB'S Embryonic Journey: The Trimesters of Caspak, which I thoroughly recommend) so it's difficult to know where I could be much use. So, I'll stick with what I love most about the story - the dinosaurs and other prehistoric creatures! ... our attention was once more directed toward the river, for around us there had sprung up a perfect bedlam of screams and hisses and a seething cauldron of hideous reptiles, devoid of fear and filled only with hunger and with rage. They clambered, squirmed and wriggled to the deck, forcing us steadily backward, though we emptied our pistols into them. There were all sorts and conditions of horrible things--huge, hideous, grotesque, monstrous--a veritable Mesozoic nightmare. This passage, depicting part of the first encounter the crew of U-33 experience of Caspak, is steeped in the earliest mythology of dinosaur fiction: a great, writhing mass of teeth and claws and scales, biting and clawing insatiably. Such apocalyptic imagery was all the rage in the early days of popular palaeontology, and undoubtedly informed Jules Verne and other authors who imbued their adventures with sea serpents with a sound basis in science. Edgar Rice Burroughs was righting centuries after the discovery and popularity of the "Great Sea-Dragons," but the discovery of creatures which ruled the land as they ruled the seas only fed the growing public appetite for such creatures of Earth's distant past. At last have mortal eyes gazed upon two reptiles of the great primitive ocean! I see the flaming red eyes of the Ichthyosaurus, each as big, or bigger than a man's head. 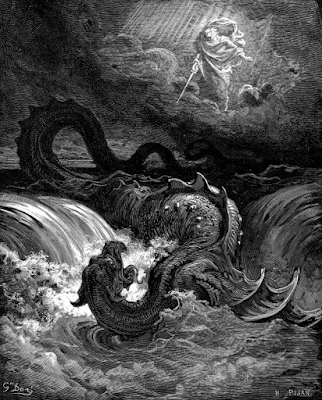 Nature in its infinite wisdom had gifted this wondrous marine animal with an optical apparatus of extreme power, capable of resisting the pressure of the heavy layers of water which rolled over him in the depths of the ocean where he usually fed. It has by some authors truly been called the whale of the saurian race, for it is as big and quick in its motions as our king of the seas. This one measures not less than a hundred feet in length, and I can form some idea of his girth when I see him lift his prodigious tail out of the waters. His jaw is of awful size and strength, and according to the best-informed naturalists, it does not contain less than a hundred and eighty-two teeth. 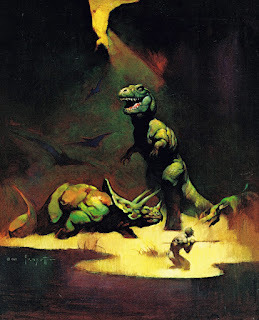 Each of the creatures in "The Land That Time Forgot" has a link and a relevance to how humanity saw dinosaurs, and through them, humanity's place in a world where every discovery seemed to change it forever. I'll be looking at the dinosaurs of Caspak in a series, comparing them to contemporaneous depictions, the scientific consensus of the time, and the modern palaeontological interpretation. Far from simply dismissing them as anachronisms fit only for the wastebasket taxon of history, there is value in what we now know to be mistakes and inaccuracies, as surely as there is value in new discoveries. Sometimes, to know where you are, you have to look back at where you came from. 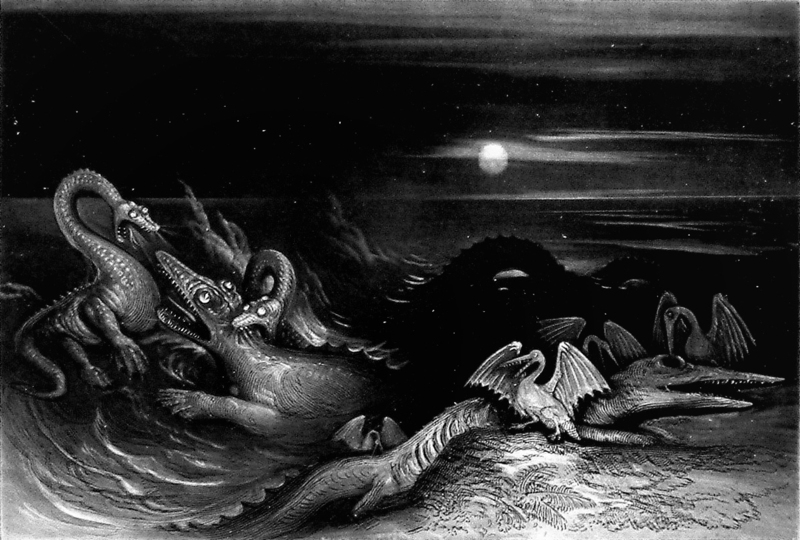 Prehistoric life in popular culture has always been as connected to mythology, religion, and folklore as it has been to science, and this is reflected in the literature of the time. 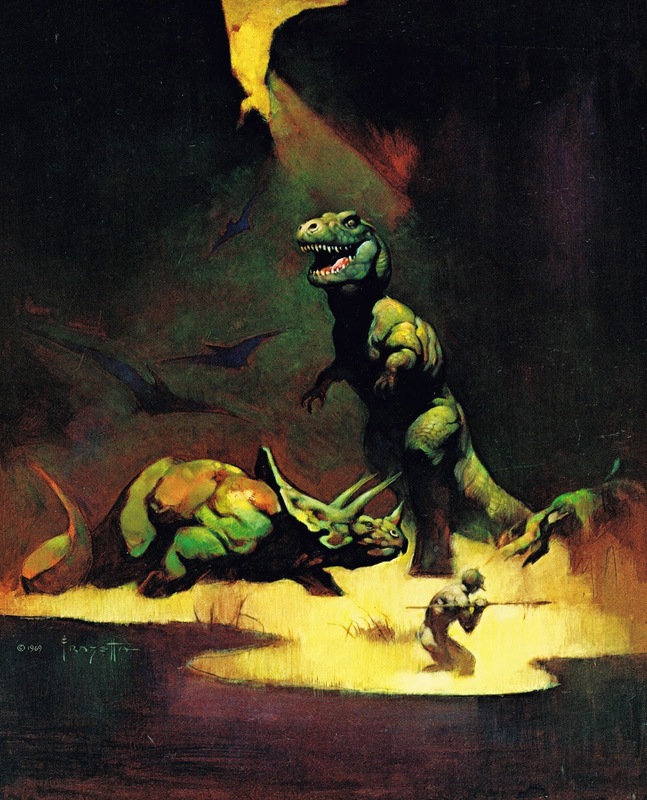 Burrough's dinosaurs, be they the dwellers of Caspak, the denizens of Pal-ul-don, the inhabitants of Pellucidar, or the xenosaurs of Amtor and Barsoom, offer an insight into man's understanding, reverence - and dread - for dinosaurs.